Aryon: … how soon can you start? I just thought it would be hilarious if Steen put “Blades Informant” on her resume – broadcasting her deepest darkest secret – because it is relevant work history! She doesn’t want a gap there, that’d look bad 😉 Also, I find the idea of a nightblade writing a resume at all to be hilarious. Also also I find “pharmacist” written in quotations to be hilarious. I’m easily amused, you see. I’ve always imagined that Steen was hired for Master Aryon’s covert ops team and made her way up to spymaster. It is her job to take care of all the quiet work, so Aryon can keep his hands clean and be a public figure. 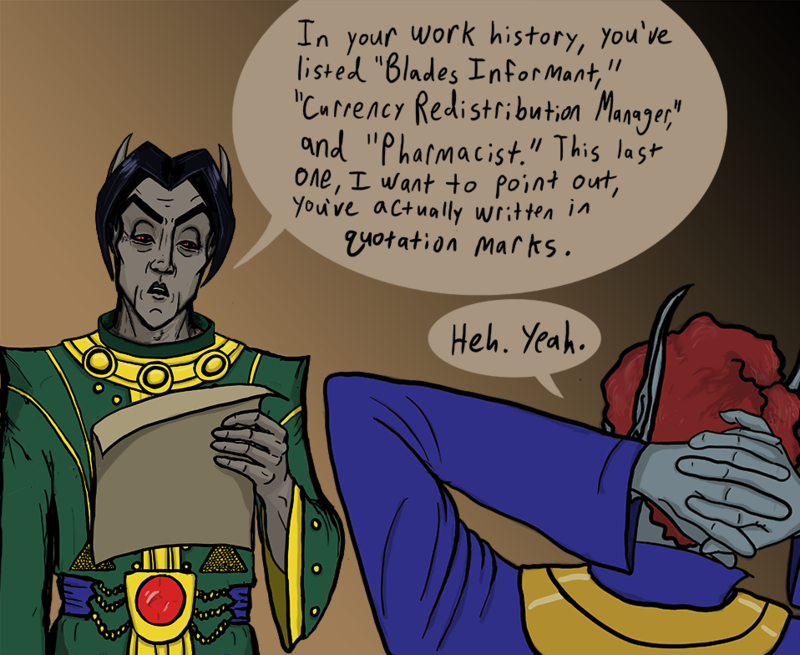 This entry was posted in Art, Gaming, Silly, Videogames and tagged comic, Master Aryon, Morrowind, The Elder Scrolls. Bookmark the permalink.